The INTELLIGENT SWITCH provides electrical distribution and remote management for up to eight network users, powered from either one or two direct mains supplies or UPS or a combination of both. INTELLIGENT SWITCH can connect each user (up to eight, each with a maximum power demand not greater than 3A), to either of the two power sources (A and B). Load demand is shown on the LCD. See "principle of operation" diagram. If one of the two power sources fails or falls outside specification, INTELLIGENT SWITCH will transfer the connected loads to the second power source (switching is instantaneous even if the two sources are not in phase). If a fault occurs with one of the loads (for example due to a short-circuit or overload), INTELLIGENT SWITCH will disconnect the load to prevent disruption to the others. Full protection against mains failures and load faults. Designed for installation in a 19" rack-mount cabinet. LCD to provide measurement/alarms/states information. 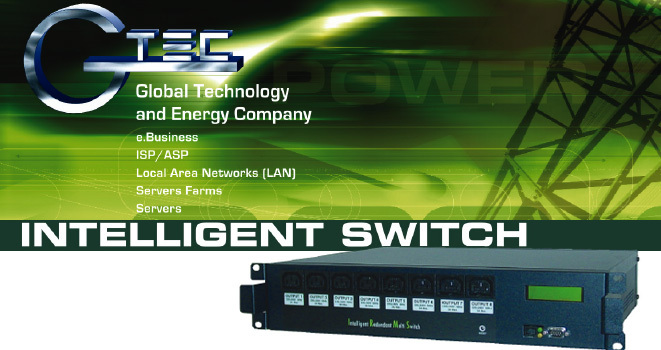 No signal connection is required between INTELLIGENT SWITCH and the power sources or supplied hardware. Configuration software provide as standard.